Dimensional weight is a pricing method used by commercial freight transport services. Also known as volumetric weight, DIM weight, or cubed weight, it takes the volume and the weight of a package into consideration when determining the shipping charges. Previously, the price for shipments was determined by weight alone. This left a lot of shipping and freight companies taking a hit financially when packages that were light in weight took up a lot of space. Dimensional weight was adopted worldwide to establish a minimum charge for the cubic space a package takes up. The dimensional factor is the minimum weight. The minimum weight for US domestic shipments is 194 cubic inches per pound, which is 8.9 pounds per cubic foot. The minimum weight for international shipments is 166 cubic inches per pound. Even if this particular package only weighed 12 pounds, it would still be charged as if it weighed 35 pounds (rounding up 34.79) in the US and charged as if it weighed 41 pounds (rounded up from 40.66) internationally. This is because the formula uses the package’s ‘theoretical’ weight, meaning if it had a density of 194 cubic inches per pound (or 166 cubic inches per pound if international). Dimensional weight favors those who ship dense packages rather than lightweight ones. For example, shipping a large box of spun cotton candy would be charged by dimensional weight, while shipping a box of cotton candy sugar would likely be charged by its actual weight. This is because the large box of cotton candy takes up a lot of space but doesn’t fill the vehicle in terms of weight, making it a poor use of space. 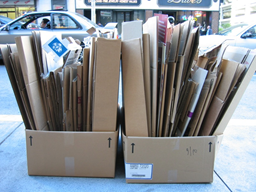 To help reduce the chance of being charged for dimensional weight, use smaller boxes, compress your goods, and reduce the amount of packing materials used if possible. Though Freight Rate Central is centrally located in Idaho, we service all across the United States. We aim to provide the most efficient and economical shipping for all of our clients, and work with a number of servicers to ensure you get only the best rates no matter your shipping needs. We take care of the details both big and small, so you can rest easy with your shipments in our hands. Contact us today at 855-FRC-SHIP (855-372-7447) to learn more about our services, or visit us online to request a free quote.